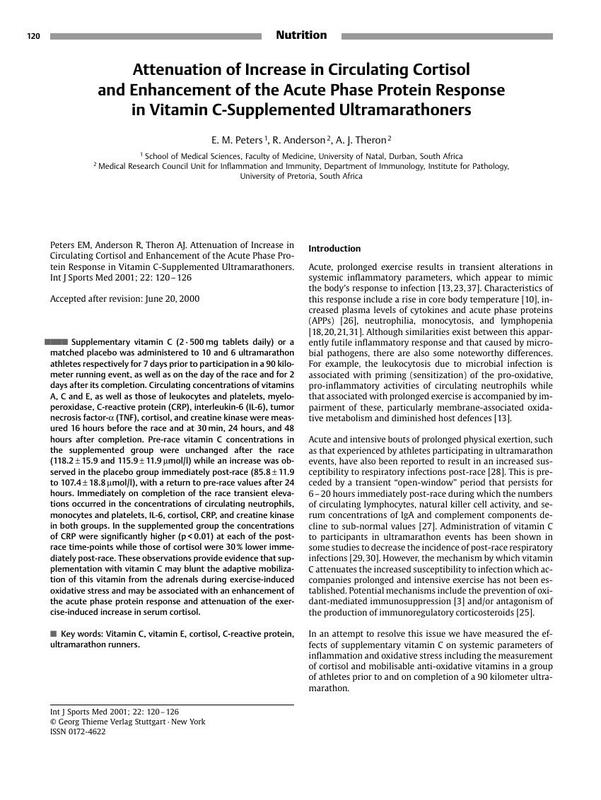 Supplementary vitamin C (2 · 500 mg tablets daily) or a matched placebo was administered to 10 and 6 ultramarathon athletes respectively for 7 days prior to participation in a 90 kilometer running event, as well as on the day of the race and for 2 days after its completion. Circulating concentrations of vitamins A, C and E, as well as those of leukocytes and platelets, myeloperoxidase, C-reactive protein (CRP), interleukin-6 (IL-6), tumor necrosis factor-α (TNF), cortisol, and creatine kinase were measured 16 hours before the race and at 30 min, 24 hours, and 48 hours after completion. Pre-race vitamin C concentrations in the supplemented group were unchanged after the race (118.2 ± 15.9 and 115.9 ± 11.9 µmol/l) while an increase was observed in the placebo group immediately post-race (85.8 ± 11.9 to 107.4 ± 18.8 µmol/l), with a return to pre-race values after 24 hours. Immediately on completion of the race transient elevations occurred in the concentrations of circulating neutrophils, monocytes and platelets, IL-6, cortisol, CRP, and creatine kinase in both groups. In the supplemented group the concentrations of CRP were significantly higher (p < 0.01) at each of the post-race time-points while those of cortisol were 30 % lower immediately post-race. These observations provide evidence that supplementation with vitamin C may blunt the adaptive mobilization of this vitamin from the adrenals during exercise-induced oxidative stress and may be associated with an enhancement of the acute phase protein response and attenuation of the exercise-induced increase in serum cortisol. Vitamin C, - vitamin E, - cortisol, - C-reactive protein, - ultramarathon runners.